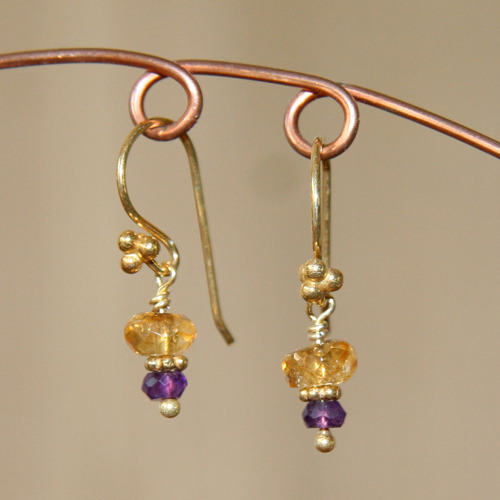 The rich colors of these citrine and amethyst accented with gold are perfect. The earwires, granulation bead and wire are vermeil - made by layering 24k gold over sterling silver. ....................................... Amethyst is said to bring peace and ease stress as well as aid in restful sleep. It has long been used to open the spiritual and psychic centers, making it one of the power stones. .......................................... These earrings are hand-made to order. Slight variations are the nature of handmade jewelry and make each piece special. They will be shipped with a complimentary organza gift bag. If you prefer a gift box, please specify in the Notes box at checkout. If you are purchasing a gift that you would like shipped directly to the recipient, I am happy to include a personal message from you. In the Notes box of the order form, mention "giftshipper" and include the text of your note.